The freshman fifteen is the dreaded weight that 70% of students gain between their first year and the end of their second year, according to the Journal of American College Health (Dryden). We’re here to tell you that there’s a way to keep that freshman fifteen off. 1) Eat breakfast- start your day off right with a healthy breakfast. You will have more energy and eat less throughout the day. 2) Keep healthy snacks on hand- Healthy snacks will satisfy your hunger, and provide longer lasting energy. 3) Take your time to eat - take at least 20 minutes a meal to eat. This will give your body time to digest the food and not feel bloated. 4) Don’t follow diet trends- the latest fad (telling you that losing 10lbs in 10 days will work) is not healthy for your body. Such diets leave you more hungry and stressed. Don’t starve your body of healthy nutrients; take time to exercise and eat healthy. 5) Eat the healthy food offered by the school – there is always a healthy option for lunch: take a salad or soup instead of the fries. It is not that hard to make a conscious choice to eat a bit healthier. Every choice matters. 6) Workout with a buddy - it’s important to exercise, because it helps burn off the study snacks and releases stress. The chemicals endorphin and serotonin are created: “As the chemical levels in your brain increase, your sense of well-being increases, and your anxiety and stress levels go down”(Ellen Lambert). Make time between classes, studying, and homework to hit the gym.It’s easier to exercise with a friend--it will be fun, keep you motivated, and be less intimidating. 7) Walk, bike, take the stairs-make habits of walking when you can, go for morning or evening bike rides, and take the stairs instead of the elevator. Doing a few activities like these will make you feel better and help build endorphins and serotonin, which fight off that hungry feeling. 8) Drink water- drink 8 cups of water daily, as this will keep you hydrated. Water will keep your body healthy and ready to go.Drinking water can help you avoid overeating, because sometimes you are actually thirsty, not hungry. 9) Sleep- get your 8 hours of sleep every night. With exams and classes your body needs to rest. “Sleeping less than five hours — or more than nine hours — a night appears to increase the likelihood of weight gain” (Donald Hensrud). 10) Manage your stress- don’t eat or drink to manage stress; instead, use sports or exercise to blow off some steam. Meditation is another way to relieve stress. Take time to relax before you eat to avoid stress eating. 11) Everything is alright in moderation- yes, it is ok to have everything in moderation. Have a handful of chips or half the chocolate bar instead. This helps from overindulging. 12) Don’t multitask while eating- when you are eating, just eat. Don’t watch tv or play on your phone. 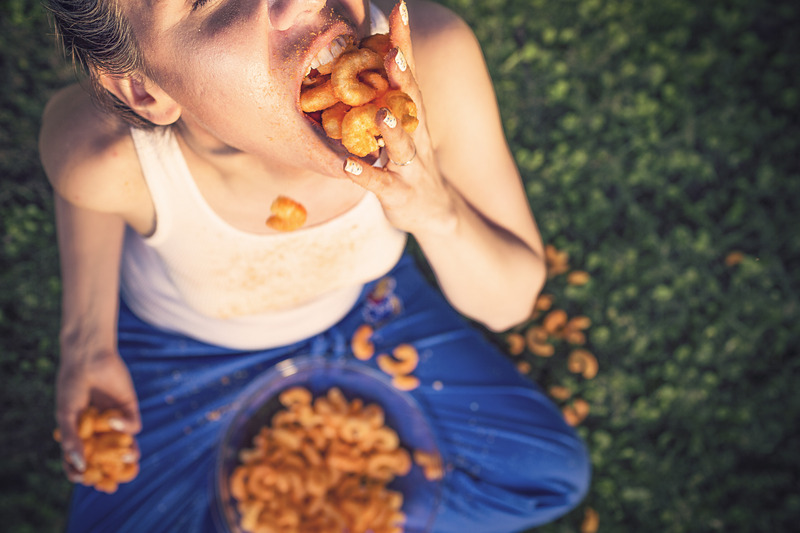 Distracted eating allows you to overindulge. Stay mindful and present when you are eating. 13) Drink tea- drinking green tea with a bit of caffeine can be good for you. Green tea has antioxidants that are great for your body. It can help boost your metabolism, to help you burn calories around the clock. 14) Don’t eat out for fun- instead of eating out for fun, go for a walk or play a pickup game. They are better choices than food! 15) Count your sugar – sugar is evil. Most likely you are surpassing the amount of sugar recommended for you. Take time to count the grams of sugar you eat at each meal and try to stay below the recommended amount. Extra added sugar is horrible for your health. It is the leading factor for obesity in children and adults. So use these tips on how to avoid the freshman fifteen and to stay fit and healthy! Enjoy your university years without gaining the extra weight. Donald Hensrud, M.D. "Is too little sleep a cause of weight gain?" Mayo Clinic. 16 04 2015. Web. 27 06 2016. <http://www.mayoclinic.org/healthy-lifestyle/adult-health/expert-answers/sleep-and-weight-gain/faq-20058198>. Dryden, Jim. "Freshman 15’ theory is validated by medical study." 15 09 2005. Web. 24 06 2016.<https://source.wustl.edu/2005/09/freshman-15-theory-is-validated-by-medical-study/>. Ellen Lambert. "How Does Exercise Influence Endorphins & Serotonin? "Demand Media.2016. Web. 27 06 2016. <http://livehealthy.chron.com/exercise-influence-endorphins-serotonin-9425.html>. Hearn, Merlin. "Water and Brain Function." Water Benefits Health. Web. 27 06 2016 <http://www.waterbenefitshealth.com/water-and-brain.html>.